Todd Friel: Is He For Real? 1. Did he read the book… does not sound like it at all! 2. Tells us piety is wrong, then tells us that the problem is the “hypocrites” in the church. 5. States over and over “WE need to change the people” ummm God changes people! ARRRRGH! When he states two types of Christians… your type and our type don’t miss the irony in all that as Todd’s picture comes up… and then he begings to promote exactly what he is speaking against! LOL! It goes on.. He talks of being anti “hypocrites” then states “WE” must change people and does not even care to see the others perspective. IF HE ACTUALLY READ THE BOOK he would have noticed the message is not changed… believe me I have read the book. I see he is misdiagnosing the problem and then ignoring any solution except his OWN WAY… and that is that instead of trusting the Holy Spirit to change people… “WE” must change them. Well I did laugh a bit… And Todd, get out of that bubble. Denny’s is not all there is in culture. Posted in Barna, books, critics of the emerging church, emerging church, James White, Reviews, todd friel, truth war, way of the master | Comments Off on Todd Friel: Is He For Real? I received a copy of the book by Dave Kinnaman and Gabe Lyons a while ago and was pretty excited to read it. I am sometimes a sucker for data and graphs and such as I expected from a book by the Barna research group. As I read through it though, it seemed as if it was old material. What I mean is this is the data to back up what many of us have already been stating and have witnessed. The “Christian” Church has become in many ways unchristian. Now, what does that mean? It does not mean we all have forsaken doctrines and such, rather it means that though we still hold many things that are true and of great value, somehow we have given off some very unchristian messages. Are we just a people that hate gays? Is that what some view sums up being a Christian? I hope not. Yet it does seem that many of us are missing the boat. Are we to be known for what we are against or Who we are for? I recommend the book. It has in it some quite differing viewpoints on how and what we need to do to change others perceptions of Christians… like Brian McLaren and Charles Colson which some might say are polar opposites so it should appeal to a wide variety of people. 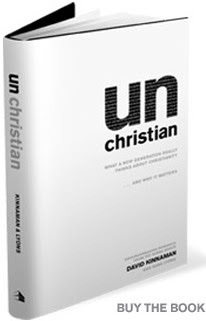 Other contributors included are Rick Warren, Jim Wallis, Chris Seay, John Stott and a few others. For more info on the book, you can check out their website. To hear an interview with one of the authors check out the Steve Brown Etc. show. Will the real James White please stand up? In this bizarre fray with some in the Lordship Salvation camp… in which a emerging perosn who “does not beleive in truth” was arguing for a pure biblica view of truth and pointing out that many Christians have infused Platonist Realism and other modernistic views, I had unfortunately confused Jim W. with James R. White. He surprised me with a visit to my blog and commented on this article. I did there and will once again apologize for that unfortunate mistake and also am very thankful that Jim W. is NOT James R. White. It seems that the real James White has a ton more class and can show much more grace. So, James I do once again apologize for this and hope that you will accept my apology and any thing I did say to or about you in good spirit as I did not mean any malice toward you. As I stated to you I do not agree with you on some points, but in no way do I not consider you a brother in Christ. Noted again I am not a Calvinist yet I am not anti Calvinist. James R. White made mention of this on his blog… so I am semi famous… again… LOL! I fine-tuned my Google Blog Search gadget and got rid of all the references to basketball and politics. As a result, I found this article by “iggy” from Billings, Montana. Thankfully, iggy later admitted his error, and recognized that there might just be more than one person on the Internet with the initials JW, or “Jim W.,” etc. If I’m going to comment on a blog somewhere, I will almost always identify myself with the signature (developed back in the 1980s for use on our BBS) of “James>>>” along with our website, http://www.aomin.org. If the comment system uses nicks instead of names, you will often see DrOakley or a variant thereof (my nick in our chat channel). For someone who makes himself so easily available, I have no reason to hide when commenting out there in the blogosphere, as rarely as I do that. Thanks again James for your gracious spirit. Though like I mentioned before I would like to here your perspective on Lordship Salvation. Posted in disagreement, emerging church, Great Calvinists, James White | Comments Off on Will the real James White please stand up?